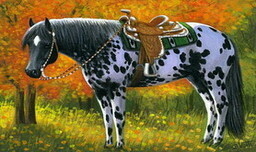 Western breeds are always shown in a leather halter, usually decorated in silver. They also have a leather lead shank with a chain end that is threaded through the halter. See picture below (thanks, Rosemary!) for how it is done. Do NOT thread the chain OVER the nose. Notice how the halter fits securely. As an alternative (although less neat and tidy), you can double the chain through the ring under the jaw and snap it back onto the last ring in the chain where it attaches to the leather lead shank. “The showmanship class shall be judged strictly on the exhibitor's ability to fit and show a horse at halter. The horse is merely a prop to demonstrate the ability and preparation of the exhibitor. The ideal showmanship performance consists of a poised, confident, neatly attired exhibitor leading a well-groomed and conditioned horse that quickly and efficiently performs the requested pattern with promptness, smoothness, and precision. The showmanship is not another halter class and should not be judged as such. All exhibitors may enter the ring and then work individually or each exhibitor may be worked from the gate individually. When exhibitors are worked individually from the gate, a working order is required. The following manoeuvres are considered acceptable: lead the horse at a walk, jog, trot or extended trot, or back in a straight or curved line, or a combination of straight and curved lines; stop; and turn 90 (1/4), 180 (1/2), 270 (3/4), 360 (full turn) degrees or any combination or multiple of these turns. The judge must have exhibitors set the horses up squarely for inspection sometime during the class. Exhibitors lead from the left side of the horse with their right hand on the lead strap, about 8 to 12 inches from the halter. Excess lead strap is held in left hand in a round coil. In the final photo, the girl is standing in the line-up on the off [right] side because the judge [not visible] is on the near [left] side and she should not obstruct the judge’s view. Note that she is careful not to stand in front of her horse [dangerous!]. When it is her turn to do an individual workout, she will move around to the near [left] side of the horse in order to lead him through the pattern, as in the 2 previous photos. Clothing: Western hat and boots, long-sleeved shirt, and dress jeans or Western-style pants. Have fun and Happy Showing! 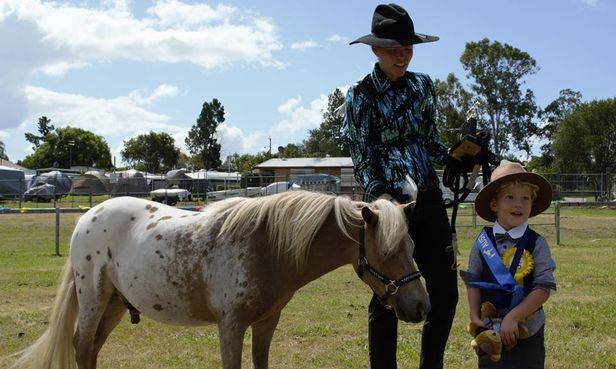 The Australian Palouse Pony Association Inc. recognises the Australian Stud Book Association, Australian Miniature Societies. In addition, other Associations approved by APPA as being recognised by that Society as being under 14hh at maturity and has no horse breeding in its background. These ponies must meet the colour requirements of the Australian Palouse Pony Association Inc. no Greys or Pintos to be bred from. 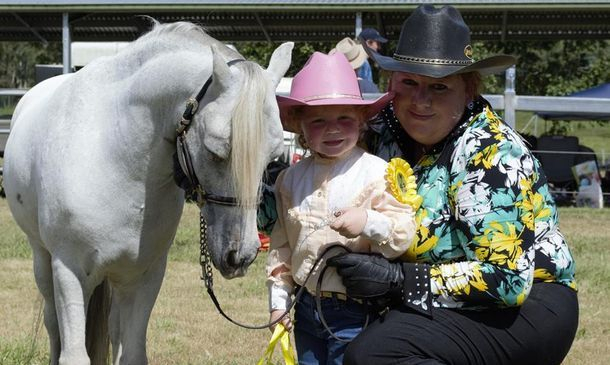 If an Australian Stud Book Pony or a Miniature Pony Mare or Stallion is used for breeding to a registered APPA stallion or mare, a Photostat copy of the papers and a coloured photo of the mare or stallion is to be sent into the Association. If a APPA Stallion is used a copy of the service certificate must be sent in when registering the foal. Any time a Palouse Pony is sold without papers, the certificate is to be sent in to the Registrar marked sold without papers. The receipt given to the owner, should be marked sold without papers, and a copy of that receipt attach to the papers sent in to the Registrar. If your pony is a solid and starts to spot or roan, send in to the Registrar with two new photos, requesting a new set of papers. The papers will then be updated. [There is no charge at this time for that]. When dual registering and you don’t have an APPA registered parent you will need to register the mare under the ID section the cost is $10.00. No dual registration will be processed without one registered APPA parent. When registering colts you need to indicate at the time of registration that the colt is entire. If this is not the case then write not entire at this time, and this will be placed on the papers. No colt will be shown unless entire. [Upgrade to Stallion at two years, vet Certificate Supplied and new photographs signed by a Veterinarian. APPA Stallions may not stand at stud under 2 years]. A small refresher to our Members the allocated Pony Registries we have available within APPA. All Coloured progeny and Solids must have two registered APPA parents - must be under 14hh and have no grey or pinto within its pedigree. All Coloured or Solid progeny and must have one registered APPA parents – must be under 14hh and have no grey or pinto within its pedigree. All Pony Geldings – must be under 14hh and have no grey or pinto within its pedigree. Pony must show strong APPA characteristics. All fillies, mares, colts and/or stallions with unknown parentage or “Dual Registered” ponies with no APPA registered parents – must be under 14hh and have no grey or pinto within its pedigree. Pony must show strong APPA characteristics. DNA Analysis required. All fillies or mares for breeding purposes only – must be under 14hh and have no grey or pinto within its pedigree. When applying for APPA registration of Palouse Ponies who are “dual registered” with other recognised Pony Societies, you will still need to supply a copy of their Registration Certificate with that particular Society and/or Association. Pony must be under 14hh and have no grey or pinto within its pedigree. at least one registered APPA parent. To upgrade your pony you should register both the Sire and Dam so that any progeny born is eligible to become “A” pony status. This allows your Stud to breed three generations pure. All Colts must pass a preliminary external genital examination to be classified as “Entire” at initial Application for Registration. The Breeder will be required to supply confirmation that the Colt has been classified as an “Entire” at initial Application for Registration. Colts that are not classified “Entire” at initial Application for Registration are not eligible for showing purposes and should not be represented as such - they will be classified as “pet only and ineligible for showing purposes” on the APPA Registration Certificate.